Preheat the oven to 400 degrees. In a large bowl, combine the zucchini, eggplant, onion, and cherry tomatoes with ¼ cup olive oil, minced garlic, minced sun-dried tomatoes, tomato paste, dried herbs, and salt and pepper to taste. Use your hands to mix everything together until very well combined. Line a sheet pan with non-stick foil or parchment paper. Spread the vegetables evenly on the pan. Roast in the oven for about 40 minutes, stirring the vegetables once halfway through baking. Transfer to bowl and set aside. This roasted ratatouille mixture can be made in advance! In a small bowl, combine the chopped basil, parsley, balsamic vinegar, and another tablespoon of olive oil. Toss the cooked ratatouille with the cubed cream cheese. Butter each slice of bread on both sides. In a large skillet, lightly brown each slice on one side. 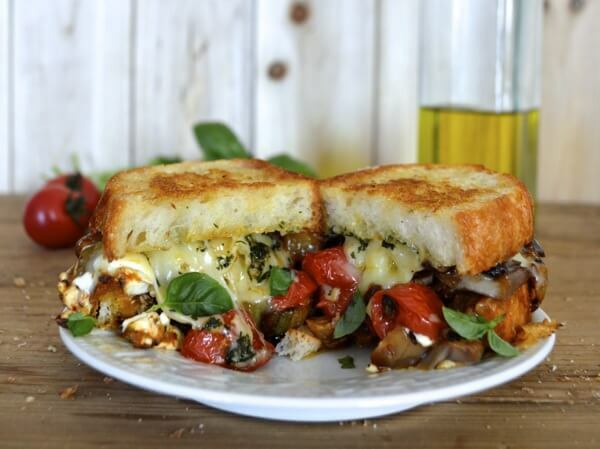 Flip the bread and spoon some of the ratatouille cream cheese mixture on four of the bread slices. Spread a couple teaspoons of the fresh herb mixture on the other four slices. Top the ratatouille halves with ⅓ cup grated cheese and cover with the herbed bread. Press lightly and grill both sides until the cheese is melted and the bread is golden brown.